Panko bread crumbs are a light, crispy Japanese bread crumb that has a lot more crunch than traditional Western-style breading. Panko is loved by chefs throughout the world because it is extremely good for breading foods like chicken and fish, and also works wonderfully as a filler in items that call for filler, such as crab cakes. What Makes Panko Bread Crumbs So Special? Coarse grind: This creates pieces that are flaky rather than crumb-like. Large Surface Area: The flakes have a larger surface area that more easily absorbs the seasoning of any given recipe. Crispiness: The flakes of panko stay crispy longer and absorb less oil or grease. Panko crumbs can be used in many different applications. In Asian cuisine these crispy flakes are usually used to make a layer of breading on the outside of various foods. Because of their flaky structure they don't tend to get soggy or compress, but instead provide an airy layer of breading for fried items. 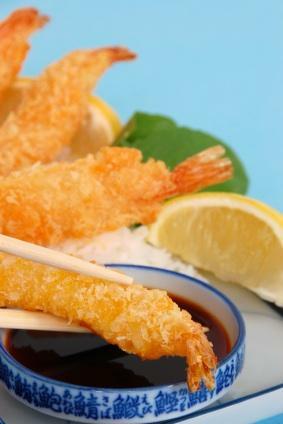 The grease easily drains from the crispy panko, which allows the food to taste less oily and heavy. It is really excellent for seafood and fried chicken. For example, try breading calamari steaks with panko and then frying them until done. You can also use them to create a baked lobster tail. With its flake-like texture, panko is also excellent in place of bread crumbs for household staples, such as green bean casserole, lasagna, or macaroni and cheese. Simply sprinkle on top to add a crunchy finish, which will contrast nicely with the creaminess of your dish. If your recipe calls for bread crumbs as a filler, such as in meatballs or seafood cakes, you can substitute panko and it will create a lighter, more airy finished product. White panko, which is made from bread without the crusts. Tan panko, made from bread with the crusts left on. Seasoned panko, which is often made with Asian spices and seasonings. Most grocery stores today carry some form of panko, but if you can't find it at your local grocers or Asian specialty food market try making your own. There are a couple of different ways to make your own panko crumbs. Using a food processor with the shredding disk attachment, push the chunks of bread through to make coarse crumbs. Spread these crumbs on a baking pan and bake until the crumbs are dry, but not browned or toasted, approximately 6 to 8 minutes. Remove the pan from the oven and allow the crumbs to cool. Once done, these crumbs can be stored in a plastic bag in the freezer for several months without going stale. Place the crackers in a resealable plastic bag and use a rolling pin to crush them until they resemble coarse crumbs. Add the spices and shake the bag until everything is well mixed. Spread the crumb mixture on a baking sheet and bake for six to eight minutes. Make sure the crumbs do not turn brown. They should be dry but not toasted. Remove pan from oven and let crumbs cool. Store in a resealable plastic bag in the freezer for several months.